Many of us know someone whose life has been affected by breast cancer. Some of us may have gone through it ourselves. Cancer is the disease that knows no religious, political, socio-economic, generational or cultural barrier. It exists everywhere. In the United States, breast cancer is the most common cancer among women, where 1 in 8 (12%) will develop invasive breast cancer during their lifetime. 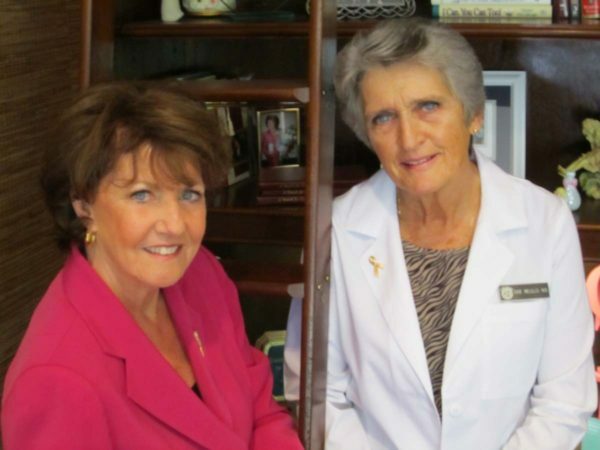 The American Cancer Society estimates more than 240,000 women will be diagnosed, and over 40,000 will die from it. Breast cancer is the second leading cause of cancer death in women, affecting 1 in 36 (3%) of those diagnosed. There is some good news, however. Since 1989, death rates from breast cancer have been dropping (although slightly increased among African American women) with larger decreases in women younger than 50. These decreases are believed to be the result of finding breast cancer earlier through screening and increased awareness, as well as better treatments. 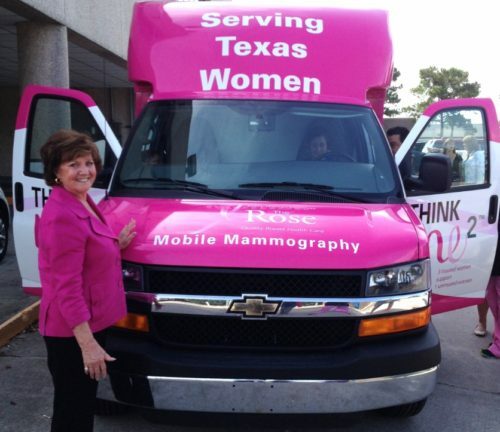 Which brings us to why clinics like The Rose in Texas, and women like Dorothy Gibbons are important in the world of breast health. Because the US healthcare system is still so fragmented and complex in a number of ways, many women aren’t able to get the preventative and early care they need to survive or even detect signs of breast cancer. The Rose has become a pivotal tool for especially low-income and immigrant women in parts of Texas. 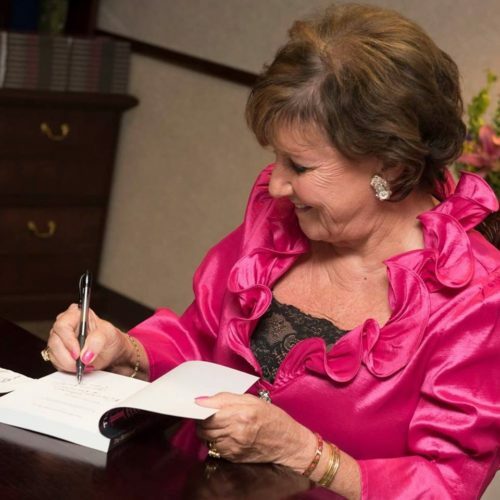 Dorothy is one of the original founders who has documented her decades long work in a new book appropriately titled ‘The Women of The Rose’. This is a book like no other as it puts names, stories and communities to a horrific disease that so often only gets seen through statistics, campaigns and media messages. We spoke to Dorothy to hear more of her mission for The Rose, and how it is helping even women in poverty get the care they need. First off, we want to express how honored we are to be interviewing a true hero to MANY women whose lives have been saved because of your tireless work! 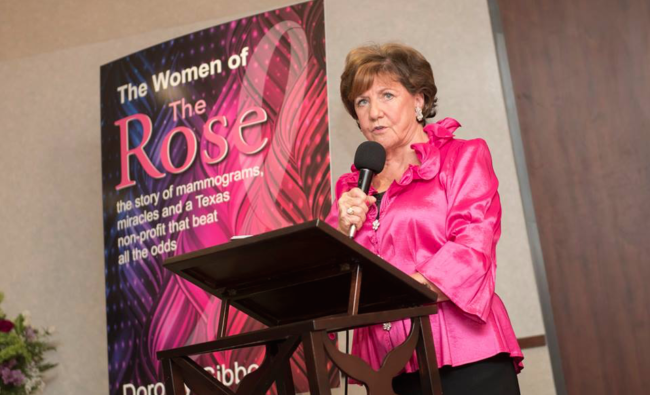 In your book about ‘The Rose’, you walk the reader through decades of growing a small idea to help women in Texas get the right resources to prevent, diagnose and treat breast cancer, into the thriving organization it is today. Why did you want to share your journey? The Rose never would have made it without people ‘believing’ in us. That’s what non-profits are all about—creating a vision and a solution that goes beyond the problem. I wanted to show what it’s like to run a nonprofit; demonstrate that a nonprofit is a business like any other business and requires the same gutsy entrepreneurial leadership spirit as any business owner. Doing whatever it takes to ‘stay alive’ and get through the day. Yet I hope my story says ‘over and over’ that it’s all worth it. The gift is in the doing. I hoped this story would encourage anyone who has a dream to ‘do something better’ to at least try and in the trying discover their own passions. One of the threads that seems to hold the book together is just how difficult it is to raise money year after year, which has enabled you and your team to get extremely creative (shrimp boils and spray-painted pink goats!). What keeps you going in the moments you want to give up? I don’t give up often. I’m always ‘clear’ that this work is ‘worth it’ even when I question my own abilities. I think the part in the book where I said to God: “If you don’t want me to run The Rose, then don’t let me wake up in the morning.” says it all. Sure I get tired, sure there are times when I don’t know where to turn and want to throw in the towel but God keeps waking me up! There is a lot of emphasis on providing service to low-income and minority women through The Rose. With so much talk about healthcare during this election, what do you want people to know about the importance of ensuring everyone has the coverage they need, no matter what their zip code or socio-economic status? This question would take hours to answer and still I doubt I could begin to explain all the issues involved or the tragedies that await when we continue to live under a broken healthcare system. A wise Canadian physician once told me that his country had two systems: Public health and Private Pay Health. But our country has three, Public, Private and “No have” system. It’s true, no health insurance, no system. I believe the worse prejudice we face in this country is the prejudice to poverty. While having insurance coverage doesn’t equate to ‘good health,’ it sure helps. Access to healthcare involves so much more than having an insurance card. We would need to address what ‘access’ really means and include having adequate physician coverage who can communicate, being able to navigate the maze of traditional healthcare, being able to find the right test or treatment in the community one lives in, pharmaceuticals that actually work, incorporating complementary medicine, allowing the individual’s belief system to be part of the healing, the list goes on and on. Years ago, I remember being appalled at hearing someone say that a person’s ‘chance’ at surviving a disease like breast cancer depends on ‘how good their insurance is’ and ’how much money they have in the bank’. After witnessing first hand all the compromises a poor or uninsured person has to make, I’ve come to see the truth in that statement. When describing your personal life, you have shared about your faith as well as your feminism. How do these two topics factor into the work you do today? I don’t think I could do this work if both those parts of my being weren’t strong and congruent. Feminism provides the passion, Faith provides the belief, and together they create a backbone that everything else hangs from. I see those topics reflected in the work my leadership team recently completed when we reviewed and updated our values. Those sixteen women came together at least twice a month for six months to hammer out what The Rose stood for and what values they as our Leadership embraced. The results were profound to me. Their top five values were: Integrity and honesty, Spirituality, Family, Dependability and Team Work. We treat every patient like we want our dearest family member to be treated. We realize that sometimes a family member needs help and like in any family, we’ll intervene and insist they abide by our values. We recognize the importance of allowing time for our personal family and expect the same attention and care to be given to The Rose family. We are big believers in electing women as there are a whole load of bad health policies being pushed by male politicians who don’t understand women’s healthcare. What are your thoughts on this, especially in regard to what you have seen in countless women’s lives through The Rose? I agree we need more women in politics although after watching this last election and the total lack of civility, I sincerely question why any sane woman would agree to put herself in that arena. But they do, and thank God they do. As important as gender is, I deeply believe that the feminine in each of us, male or female, needs to be ‘allowed’ and valued. The Earth is crying out for the same, she is begging us to pay attention. The feminine in each of us knows how to nourish, to take care of self and others and she also knows how to fiercely protect those she loves. Imagine this world, and the future, if the feminine were allowed to fully exist. We see a lot of campaigns raising awareness about breast cancer cure research. Can you tell us why it is important to also donate to organizations like The Rose who are helping women who have already been diagnosed? Early detection is still the best chance a woman has for beating this disease and having a chance at survival. The fact that we’ve built a culture where women are encouraged to care for themselves and one in which every woman who has a mammogram with us helps an uninsured woman receive the same quality service, are part of why it is so important that The Rose continues. Our hallmark program and incredibly important service is Patient Navigation. The women who is uninsured and can’t afford the $150 for a mammogram sure doesn’t have the money to pay for the $150,000 (or more) for treatment. Our Navigators move every uninsured woman who is diagnosed into treatment and walks with them on their journey. 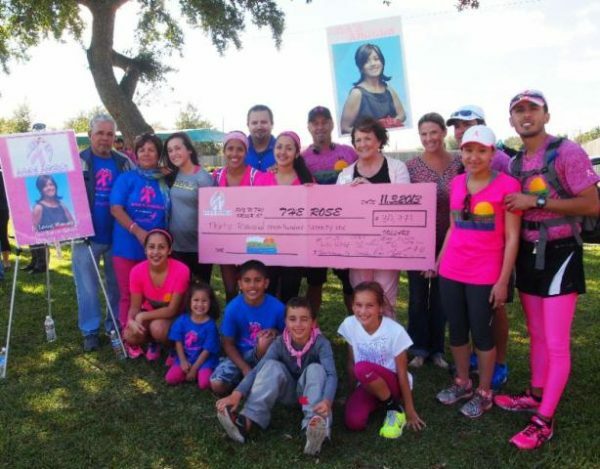 What are some of the other organizations you have teamed up with to raise awareness about breast cancer education? The Rose is a huge collaborator. If organizations want to team up we’re ready and willing. That is one of the reasons why in a recent survey of 92 different community clinics and organizations, The Rose was listed was one of the top six organizations they listed as a major collaborator. 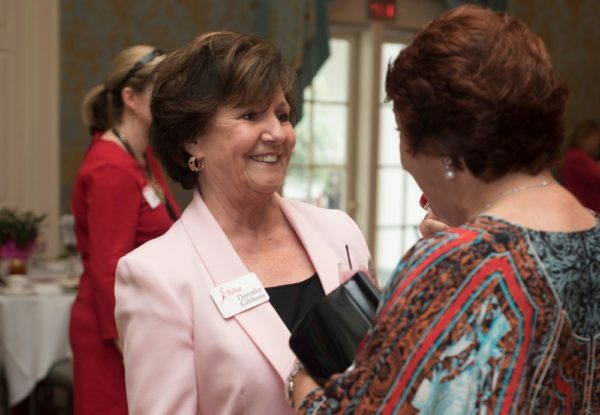 Can you share some of the most impactful feedback from women you have helped that has stuck with you throughout the years? If readers want to donate to The Rose how can they do this? Go to our website: www.therose.org or call me 281 464 5123.